Welcome to the Chalk’s Industrial Equipment Sales, Inc. Rentals Department. Having the right type of forklift that fits the type of job that you need it for is extremely important when you have project costs and deadlines. Our technicians can assist you in selecting the right type of forklift and arrange delivery and pick-up at your location if needed. Whether you need a rental forklift for a day, a week, a month, a year or longer, our technicians are ready to work with you. Forklift training is also available. 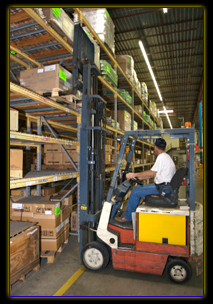 We have a wide variety of forklifts so we can customize your rental needs. Our rental fleet includes forklifts from 2500 lbs. capacity to 30,000lbs capacity. Please click on the Request an Estimate button below to fill out an online form to receive pricing or for further assistance. After submission, a forklift rental representative will contact you during our regular business hours. You can also choose to call us at 410- 686-6800, or stop by our shop. Thank you for doing business with Chalk’s Industrial Equipment Sales, Inc. in Baltimore, Maryland!